The parents of the 4-year-old girl killed in a recent hit-and-run accident on the Upper West Side went to court on Tuesday seeking justice for their child. Russo and his wife held a press conference after attending an appearance in Manhattan Supreme Court by the defendant in the case, Franklin Reyes, 17, who was accused of striking the girl with his SUV while fleeing from the police in a high-speed chase because he lacked a driver’s license. The Russo family and their lawyer Sanford Rubenstein urged that Reyes receive the maximum sentence. new jordan Three months ago the Russos objected vehemently when the boyish defendant was granted bail. In the courtroom Judge Gregory Carro adjourned the case till November 6 while a probation report was prepared. Charges against the defendant were updated to manslaughter in the second degree for which he faces a maximum sentence of 5 to 15 years. The Russo family was scheduled that evening to ask the local community board to rename the scene of the accident Ariel Russo Way to honor her memory. President Barack Obama focused on the Middle East in a speech to the United Nations on Tuesday, while rumors circulated that he might meet with Iran’s newly elected President Hassan Rouhani, who also spoke to the General Assembly later in the day and who had sent signals that he wanted to end his nation’s international isolation. If the world leaders crossed paths, it would be the first time an American president met an Iranian leader since Jimmy Carter spent New Year’s Eve with the Shah of Iran in 1977. In the speech before hundreds of diplomats gathered in New York for the General Assembly , Obama said Rouhani’s election indicated that Iran was moving toward a “more moderate course.” The president said he had instructed Secretary of State John Kerry to pursue negotiations with Iran. Kerry was scheduled to meet with Iranian Foreign Minister Mohammed Javad Zarif on Thursday, along with representatives from five other countries. The two leaders exchanged diplomatic letters last week, roshe run hyp qs which marked the first time Obama had written to an Iranian president. If the two leaders meet face-to-face, in what was expected to be a brief handshake, it could further signal both countries willingness to open a dialogue. Meanwhile, politicians opposed to any meeting between Obama and the Iranian leader held a rally nearby, where they accused the Iranian leadership of engaging in “mafia executions”. This would not be the first time Obama has drawn criticism for a handshake. He drew fire from Republicans in 2009 for shaking hands with then-Venezuelan president Hugo Chavez, a vocal critic of United States. Activist groups gathered outside the U.N. since the early morning to protest Iran’s nuclear program. While some of the demonstrators supported negotiations, others said Rouhani’s outreach to the West did not signal a genuine intention by Iran to dismantle its nuclear program. America’s allies in the region were watching Obama’s behavior closely. If he shakes hands with the Iranian leader, it would alarm countries like Israel and Saudi Arabia, who worry about Iran’s nuclear program and its support of Syrian President Bashar Al Assad. Supplies have fallen to a critical level at the New York Blood Center. Officials say there is less than a one-day supply of O-negative blood, an antigen-free blood type that is particularly valued because it can be administered to anyone in an emergency. A- and B-negative stocks are also low. Established in 1964, the non-profit organization supplies blood, platelets and other plasma products to approximately 200 hospitals daily in New York, New Jersey, Connecticut and Pennsylvania. Blood lasts for less than two months, so the center has to constantly renew its supply. Brooklyn hospitals have different ways of dealing with blood shortages. Some, such as Methodist Hospital and the Brooklyn Hospital Center, rely on national networks and are not affected by regional problems. Others have backup plans. Coney Island Hospital, a New York Blood Center affiliate, uses Metro Blood Services to maintain patient care, said Associate Executive Director of Public Affairs Robert Cooper. To find a location to donate blood, visit the New York Blood Center website. To hear Fox describe the process after blood is donated, click below. Photo: A New York Blood Center truck is parked outside Brooklyn’s Midwood High School after a blood drive (Kiran Sury photo). The nation’s longest publishing Spanish-language newspaper, El Diario/La Prensa, unveiled plans on Tuesday to partner with Columbia University to preserve its collection of over 5,000 photographs as part of its anniversary celebration. The photos were co-curated by Frances Negron-Muntaner, director of Columbia’s Center for the Study of Ethnicity and Race, and range from the 1970s to the present. Negron-Muntaner said the photos in the exhibits will let people see through the eyes of El Diario’s photographers. The photos range from depictions of neighborhood festivals to prominent persons and common street scenes. The idea of archiving and sharing the photos first occurred to Rosado last year when she realized the large and rich collection of photos they had. While the collection contains photos mostly from the 1970s and onward, the history of El Diario/La Prensa dates back to 1913 when the first issue of La Prensa was published. The paper covered local news, as well as news from Latin-American countries and took part in community events such as raising money for victims of an earthquake in Puerto Rico in 1917. La Prensa merged with El Diario in 1963 and adopted the slogan “El Campeon de los Hispanos” or “The Champion of Hispanics.” This is something that Rosado takes to heart. The exhibits at Columbia will be part of a series of special events being hosted by El Diario/La Prensa through the rest of 2013 including a “Latino Theater and Music Fiesta” at Grand Central Terminal. Through these exhibits, Rosado hopes to show El Diario’s part in New York history. On October 12, the Empire State Building will light up in red and blue to commemorate the exact date which El Diario published its first issue and to honor its legacy. The New York Public Library, the largest circulating library system in America, is a crown jewel for those on a quest for knowledge. This is especially true for the thousands of immigrants who are naturalized each year. President and CEO of the library, Dr. Anthony Marx recalled roaming the halls of his home branch of Inwood where teachers were found nose deep into literature, designing lesson plans. Other residents sat at computers, browsing the Web because they didn’t have access at home. One young man Marx distinctly remembered. When asked what he was doing there, the man, who spoke only Spanish, explained that he had recently emigrated from the Dominican Republic. He was living in a two-room apartment with eight people. There was no place for quiet, and more importantly, there were no books. To this man, the library was home. He came every day during his lunch hour because he had access to information and librarians to serve him, all for free, no questions asked. “What is it you come in to read?” Marx asked. The man showed him a large book with prints of Renaissance paintings. “I come in here every day to see pictures of angels,” he said. Some 18,000 people became U.S. citizens in 180 naturalization ceremonies across the nation from September 16 to the 23. In the 2013 fiscal year, 503,104 people were naturalized. The men and women at this naturalization ceremony hailed from 40 different countries. Sunitha Akula, a computer software engineer living upstate and her husband Pavan have been in the U.S. for 14 years. Her husband, Pavan, praised the educational opportunities in the States, something they appreciated as parents. The couple’s sons, ages 10 and 7, who were dressed patriotically in blue pants, white and blue stripped shirts, and red ties, waved American flags proudly as they watched their parents. However, there are many people who are not as lucky. According to the U.S. Immigration and Customs Enforcement, about 400,000 undocumented aliens are deported each year. Akula said he supports the path for immigration and those facing deportation should be reviewed case by case. Since the Senate passed its comprehensive immigration reform bill in June, the issue has picked up speed in Congress. However, the bill is still in legislative limbo with roadblocks from the House of Representatives and now the overshadowing events in Syria. Tin Nguyen, who has been working in a nail salon for five years, said how much finally becoming a U.S. citizen meant to him. “I have been waiting all of my lifetime,” he Vietnam native said. Professor Karl Bardosh, who teaches film at NYU, emigrated from Hungary and settled in Brooklyn in 1970. “I feel more at home in a country with immigrants,” he said. Coming from a former Communist country, Bardosh said that most people born here take freedom for granted because they can’t compare it to the outside world. As an international filmmaker, he has seen the world and said that the United States is still the number one country where determined people can achieve their dreams. “You can be the master of your own plan and that’s freedom,” he said. At the ceremony immigration official Denis Riordan announced the names of each country of origin of applicants who then rose from their seats before being awarded the naturalization certificates. By the time all the countries were named, they all stood tall like a united community. Tathiane Thompson, 28, who emigrated from Brazil 10 years ago, said one of her favorite things about being in the U.S. is the diverse culture. An accounting major in her fifth and final year at Pace University, Thompson said she was excited for her journey to nationalization to come to an end after applying in January. Whether Congress is able to come to a consensus over immigration reform before the end of this year, it is important to reflect on immigrants who came to this country seeking a place where democracy was not just an ideal, but a reality. These realities were told through the stories of WWII survivors and keynote speakers Ida and Kenneth Dancyger, who themselves became citizens at the ceremony. Ida, a Holocaust survivor from Poland, emigrated first to Canada in 1949. Her husband fled Nazi Germany for Canada during the war. Now they were becoming citizens of the U.S.
Christine Quinn, once the favorite to win the Democratic mayoral primary, air jordan 1 femmes on Tuesday endorsed her former rival Bill de Blasio in a move that further unified the Democratic Party after a fiercely competive and crowded primary election. “By working together, we will build a stronger city where no New Yorker is left behind,” said the City Council Speaker who went from first to third place in the race as de Blasio’s political meteor soared. Quinn’s endorsement came a day after another former rival, Bill Thompson also cited the need for Democratic unity when he threw his support to de Blasio. Thompson, who came in second, gave up the quest for a run-off, making de Blasio the last-standing progressive standard-bearer. Accepting her endorsement, de Blasio praised Quinn’s behavior during the campaign. De Blasio’s turned his aim at Republican candidate Joe Lhota, the former MTA Chairman who spent the day courting Democratic voters that he will need to win the election in a city where registered Democrats outnumber Republicans by a wide margin. Early Tueday he met with leaders of DC 37, the union that represents public employees, and traveled to Harlem later in the day to meet with Rev. Al Sharpton. When asked why he was targeting constituents who were unlikely to endorse him, Lhota said that he intended to run a campaign that represents “all New Yorkers” and accused de Blasio’s campaign of spreading a divisive message. Lhota also cited his previous positions in City and State government to demonstrate his ability to lead the city. “I’m the only candidate running for Mayor who will be ready on day one,” he said. A jury was empaneled Tuesday in the murder trial of a 36-year-old Bronx man accused of shooting a three-time Golden Gloves winner at a local bodega five years ago. After being sworn in the jury was dismissed as the case was scheduled to start on October 16. The charges grew out of an angry confrontation between the boxer, Ronney Vargas, 20, and Coimbre who reportedly disapproved of a romantic relationship between the victim and Coimbre’s neice. After the encounter, Coimbre followed Vargas to a Bronx bodega where he pistol-whipped and then fatally shot him in the chest, authorities said. At the time of his death Vargas had just turned professional and compiled an 8-0 record. He won the Golden Gloves title in 2005, 2006, and 2007. Since his death, local boxing events have been held in Ronney Vargas’s memory – including a recent card of bouts at the Willis Avenue Boxing Gym headlined by his brother Ronniel, who is also a boxer. This May the corner of Wales Ave. and 152nd St. in the Bronx was renamed ‘Ronney Venezuela Vargas Place’ in honor of the slain boxer. The foghorn tooted and the 3:30 p.m. ferry left Whitehall Station bound for the “forgotten borough” of Staten Island on Tuesday – with Bill de Blasio along for the ride. But the liberal public advocate courting votes in his bid for the Democratic nomination for mayor in the city’s most conservative outpost didn’t venture any farther into the borough than the terminal on the Staten Island side, where he shook hands, answered questions and posed for photos with passengers before heading back to Manhattan. The six-foot-five candidate, hard to miss among the commuters, got a mixed reception. “He’s a politician, just like them all,” said Lauren, a Staten Island resident who declined to give her last name. But other commuters were inclined to give the candidate – who sailed with wife Chirlene and daughter Chiara – to give him the benefit of the doubt. “The fact that he is taking public transportation shows an effort to be a man of the people, said Patrick Broderick, another Staten Island resident . Well, in the ferry terminal, anyhow. New Yorkers went to the polls on Tuesday in two party primaries that set the stage for the end of the long tenure of Michael Bloomberg, with the mood of the voters seeming to look forward to a more progressive era in city government. In the unusually crowded Democratic field were Public Advocate Bill de Blasio, former Comptroller William Thompson Jr., City Council Speaker Christine Quinn, former U.S. Representative Anthony Weiner, Comptroller John Liu, former City Councilman Sal Albanese, and Erick Salgado, a Staten Island pastor. 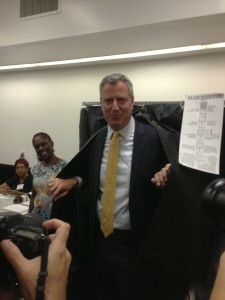 Bill de Blasio emerges from voting booth in Park Slope. The clear front-runner was de Blasio who, polls show, free run 3.0 v3 femmes held an approval mark of 39 percent , razor close to the 40 percent he would need to avoid a runoff with his closest competitors, Thompson (25 percent) and Quinn (18 percent). If necessary, the runoff would be held on October 1. De Blasio surprised political observers by quickly taking the lead over his more well-known rivals by marketing himself as the most anti-Bloomberg of the candidates. “We’re ready for a runoff and we feel confident in a runoff,” said a beaming de Blasio after voting with his wife Chirlene in Park Slope. Christine Quinn holds hands with her wife Kim Cutullo. gay candidate. 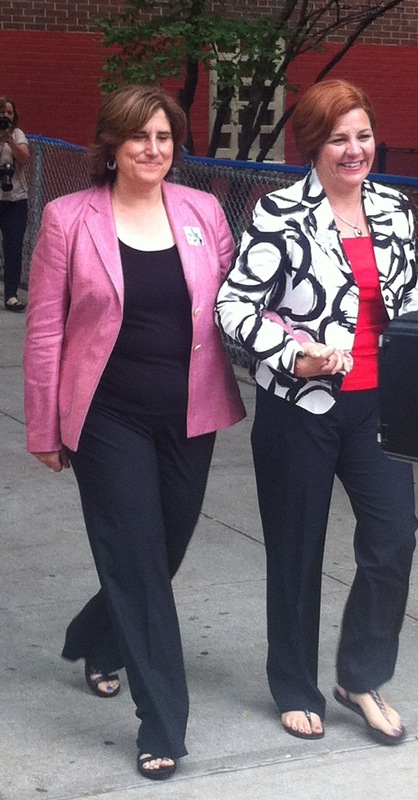 Quinn and wife Kim Catullo arrived around 10 a.m. to P.S. 33 in Chelsea to vote. Outside she spoke of her plans to build 80,000 units of new affordable housing with 40,000 units for the middle class, as well as making sure that stop-and-frisk comes to an end. The less crowded Republican field featured former MTA chief Joseph Lhota, who leads in the polls, battling it out with his closer competitor,billionaire businessman John Catsimatidis, and homeless advocate and entrepreneur George McDonald trailing the field. Catsimatdis voted Tuesday at 110 East 60th with his wife Margo, son John Jr., and daughter Andrea. “I grew up in Harlem and won’t forget where I came from,” he said. Known from his rags to riches story, the Gristedes supermarket chain owner portrayed himself to reporters as the candidate of the outer boroughs as he stood on East 60th Street in Manhattan. 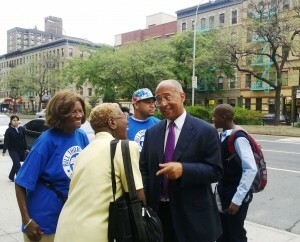 Bill Thompson schmoozes voters in Harlem. On the Democratic side Bill Thompson hit all five boroughs on a 24-hour whirlwind tour before voting at P.S. 242 in Harlem. He had sprinted across the city, including a midnight stop at a 9/11 memorial at Rockaway Tribute Park in Queens and attended a pro-gun control candlelight vigil in Brownsville, where a one-year-old boy was fatally shot last week. 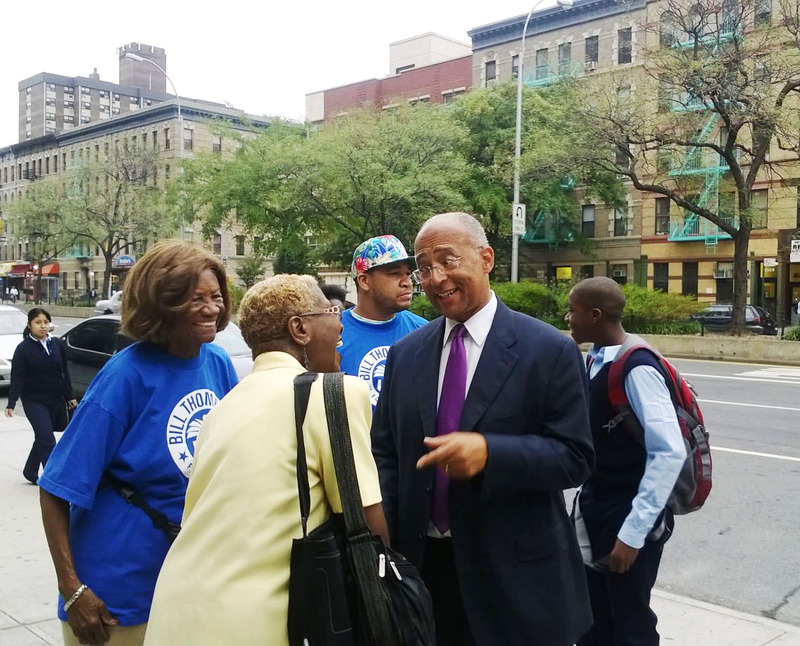 After casting his ballot, Thompson traveled to the 148th Street subway station in Harlem to greet morning commuters. Members of the United Federation of Teachers, which endorsed Thompson’s campaign earlier this summer, joined him there to promote his campaign and remind residents to vote. Charon Robinson, 44, said she planned to vote for Thompson because of his experience as former head of the Board of Education. Only fewer than 800,000 of the city’s 3.4 million registered Democrats and Republicans were expected to vote in the primaries. However, the mostly sunny skies were expected to boost turnout. Campaigning in his home borough of Queens Democrat John Liu, polling at only 4 percent, free run 3.0 v4 still had his usual bravado. “Tonight we expect to have a big victory party,” he said. Liu also referred to the legal troubles by associates that dampened his campaign. “There has been every curve ball imaginable thrown at me for this campaign,,” he added, “but we have continued to go steady full steam ahead.” He has been under scrutiny after his treasurer and fund-raiser were both found guilty of campaign contribution fraud. 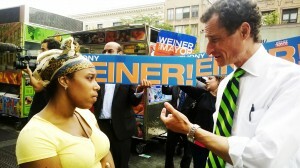 Anthony Wiener speaks to voter on 125th Street. His numbers now stood at six percent. The whiff of scandal also entered the race for City Comptroller after disgraced former governor Eliot Spitzer challenged former borough president Scott Stringer who was earlier expected to have a cakewalk to the office. Spitzer, trying to resurrect his political life after he resigned in a prostitution scandal, filed his candidacy just before deadline and used his considerable fortune to fund the campaign. The race, bitterly contested, stood at a dead heat. The phone lines were jammed Tuesday as a voter helpline in Manhattan was flooded with complaints from all five boroughs about broken or stuck levers on the voting machines. The primary elections featured the old lever-style machines, which date from the 1960s but were replaced in 2012 by optical scanning machines costing nearly $95 million. Since the newer machines posed problems last year, resulting in long lines at the polls, the State Legislature authorized the return of the older machines for the primary and runoff elections, adding that the electronic scanners would be ready for the November general election. Emergency paper ballots were on hand at polling sites if problems arose. Indeed. Republican mayoral candidate Joe Lhota had to file a paper ballot as he encountered a broken machine as he voted in Brooklyn. One voting site reported running out of paper ballots and voters were told to come back later. “These are some of the issues which causes votes to not be recorded, in which case the issue will be called in,” said Tassia Rosa, a BMCC Project Coordinator of NYPIRG. Some voters also called in to the downtown Manhattan hotline complaining of not being in the registration book at their polling site. Hotline volunteers would then look up the address of the caller and double check to see if the caller was in fact at the correct site. “This problem is often referred to as ‘right church, wrong pew,’” Russianoff said, referring to votes cast in the correct precinct but the wrong site. Board of Elections spokeswoman Valerie Vazquez-Rivera conceded that there had been “isolated instances” of malfunctioning machines and that paper ballots were used instead. Although there were various complaints about broken machines, even some of the candidates having some trouble casting their ballot, Vazquez-Rivera said that all the problems were fixed early in the day. “NYPIRG is the watch-dog of democracy,” Rosa said. “It’s a big time in NYC—it’s time for a new mayor.